SLAVYANSK, Ukraine -- Ukraine launched an offensive against separatist forces for control of a besieged eastern city Friday, while clashes between pro- and anti-government activists in the previously calm southern port of Odessa led to a fire that police said killed 42 people. Ukrainian soldiers stand at a checkpoint they seized in the early morning near Slavyansk. The first serious offensive by the government in Kiev and the dozens of deaths in Odessa sharply escalated the crisis that has led to the worst tensions between Russia and the West since the Cold war. The Kremlin said the battle for the separatist-held city of Slavyansk effectively destroyed the Geneva pact aimed at cooling the unrest in the deeply divided country. Oleksandr Turchynov, Ukraine's acting president, said many insurgents were killed or wounded in the eastern offensive that also underlined the military's vulnerability. The military action came two days after Kiev said it had lost control of eastern Ukraine. Both sides said two Ukrainian helicopters were shot down by the insurgents near Slavyansk, killing two crew members, while authorities said another seven people also died: three separatist gunmen, two soldiers and two civilians. By nightfall, Ukrainian troops and armored personnel carriers blocked all major roads into Slavyansk, and the central part of the city remained in the hands of pro-Russia gunmen, according to Associated Press journalists inside. Most shops were closed, and the few that were open were crowded with customers stocking up on supplies. Sporadic gunfire was heard in Slavyansk's downtown late Friday, while Russian news reports said there were armed clashes in the nearby town of Kramatorsk. There was no immediate independent confirmation of fighting. The Ukrainian Security Service said one helicopter was downed with a surface-to-air missile, adding that the sophisticated weapon undercut Russia's claims the city of 125,000 people was simply under the control of armed locals. 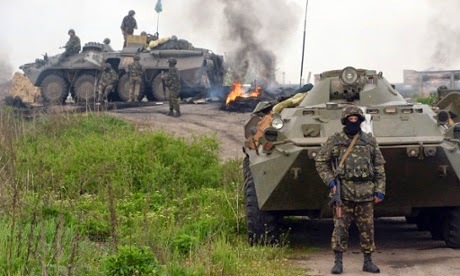 "Ukrainian security forces so far are not ready for large-scale military actions; moreover, such actions could provoke Russia's invasion," said Kiev-based political analyst Volodymyr Fesenko. Russia has massed tens of thousands of troops in areas near Ukraine's border. Kiev claims Moscow is preparing to invade and that it is fomenting the unrest in the east, where insurgents have seized government buildings in about a dozen cities and towns. The Kremlin denies the allegations, but Foreign Minister Sergey Lavrov has warned Russia would respond to attacks on its citizens or interests in the east. Unlike eastern Ukraine, Odessa had been largely tranquil since the February toppling of President Viktor Yanukovych, who fled to Russia. But clashes erupted Friday between pro-Russians and government supporters in the key port on the Black Sea coast, located 550 kilometers (330 miles) from the turmoil in the east. Police said the deadly fire broke out in a trade union building, but did not give details on how it started. Earlier, police said at least three people had died in a clash between the two sides in the city of 1 million. According to Ukrainian news reports, the pro-Kiev demonstrators broke up an encampment of Moscow supporters outside the trade union building. The latter took refuge in the building, which then caught on fire. Odessa police spokesman Volodymyr Shasbliyenko told AP the fire apparently was caused by Molotov cocktails. He had no further details or identities of the victims. Russia's Foreign Ministry said the fatal fire was "yet another manifestation of the criminal irresponsibility of the Kiev authorities who indulge insolent radical nationalists ... which are engaging in a campaign of physical terror" against those in Ukraine who want more autonomy for the pro-Moscow regions. A spokesman for Russian President Vladimir Putin said the Ukrainian offensive "effectively destroyed the last hope for the implementation of the Geneva agreement" of two weeks ago that aimed to defuse the crisis. But Dmitry Peskov also said Russia "continues to undertake consistent efforts on de-escalation." In Washington, German Chancellor Angela Merkel and President Barack Obama warned that Russia could be hit by new sanctions from the U.S. and the European Union if it continues disruptive actions in Ukraine. Previous sanctions are showing signs of significant effect on the Russian economy. The fighting in Slavyansk, a city about 160 kilometers (100 miles) from the Russian border, broke out around dawn. Stella Khorosheva, a spokeswoman for the insurgents, said three fighters and two civilians were killed in the clashes. The Russian state television channel Rossiya-24 showed one man who they said was a wounded helicopter pilot surrounded by pro-Russia forces. Several foreign news crews, meanwhile, were detained for several hours Friday by nervous pro-Russia militia before being released. CBS reported that one journalist was beaten. Slavyansk is strategically key because Ukraine has a huge stockpile of automatic rifles and other light weapons near the city, according to a commentary Friday for Britain's Royal United Services Institute defense think-tank. "Today, Kiev has upped the ante in the standoff and will test Russian resolve to prevent the Ukrainian government from regaining control of the city and its light weapons stockpile," the think-tank authors wrote. Turchynov said some government troops and police in eastern Ukraine were "either helping or cooperating with terrorist organizations." He said Ukrainian forces were working to prevent the unrest from spreading other areas. At Russia's request, the U.N. Security Council met in an emergency session Friday on Ukraine. Russian ambassador Vitaly Churkin demanded a "swift halt of all violence," but Western powers scoffed at his country's indignation. "Russia ... has released bands of thugs on Ukraine ... and is suddenly discovering this mixture might escape its control," French ambassador Gerard Araud said. Ukraine, a nation of 46 million, is torn between those in the west who favor closer ties with Europe and many Russian-speakers in the east who look toward Moscow. Separatists who have seized government buildings in at least 10 eastern cities amid fears that Moscow is seeking a pretext to invade or annex more territory like it did with Ukraine's Black Sea peninsula of Crimea in March. The peace deal in Geneva last month aimed to get those who had seized government buildings in Ukraine to leave and calm down the tensions that have prompted the United States and the European Union to slap Russia with rounds of sanctions. The Russian Foreign Ministry accused Ukraine's government of using "terrorists" from ultranationalist organizations for Friday's military operation. It also claimed that Kiev deployed tanks and helicopters that were "conducting missile strikes on protesters," something that neither side in Ukraine reported. An AP crew also saw no evidence of missile strikes in Slavyansk. Russia also cited insurgents in Ukraine as saying that some of the government attackers spoke English -- an insinuation that the Ukrainian military was getting some help from the West. TV crews from Sky News and CBS were detained Friday on the outskirts of Slavyansk. Sky News said in a statement its crew was detained for several hours but is now "safe and well." CBS correspondent Clarissa Ward told "CBS This Morning" that she and her crew were stopped by pro-Russia insurgents at a checkpoint just outside Slavyansk, then taken to a nearby town where they were blindfolded tightly with masking tape. They were released several hours later, unharmed except for one man who was beaten. Kiev's interim government came to power after Yanukovych fled, drummed out by months of anti-government protests. Ukraine plans to hold a new presidential election on May 25.